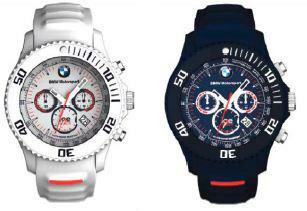 As a result of our great cooperation with ICE Watch, we now have the pleasure to offer you 2 exclusive BMW Motorsport watches in two different models, Silicon and Chronograph in two colors and two different sizes. 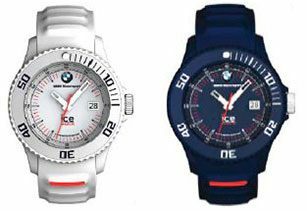 These exclusive watches are designed especially for BMW Motorsport and will excite every motorsport fan with their outstanding features and modern design. Please call (888) 980-4083 for more information. Show your sense of timing with this sporty automatic generating movement watch produced exclusively for BMW Canada. This precision timepiece features an automatic generating movement (combining the precision of a quartz watch with the style and luxury of an automatic watch). No need for a battery as this exclusive M watch is powered by the movement of your arm. 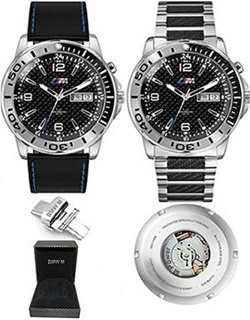 However, unlike traditional automatic watches, the 2013 BMW M watch has an additional power unit which provides a power reserve of up to 6 months without the need for additional charging. There are only 500 units available in each style. Available only while quantities last.